Do you find yourself a little happier this season as you search local shops for holiday gifts? Are you tap dancing a Newsies routine through the aisles of Tons of Toys, or singing Sound of Music tunes as you browse books at Short Stories? You can thank Kathryn McManus, founder/director/producer of Spotlight Kids Company (SKC), and the talented cast and crew of the upcoming SKC production of A Little Princess! With their show less than two weeks away (see dates and times below), the cast of more than 30 kids in grades 3-10 still found the time in between rehearsals to create an even stronger bond with each other by working on SKC's The Spotlight's On YOU Project (#SpotlightOnYOU) to help spread joy throughout our town. 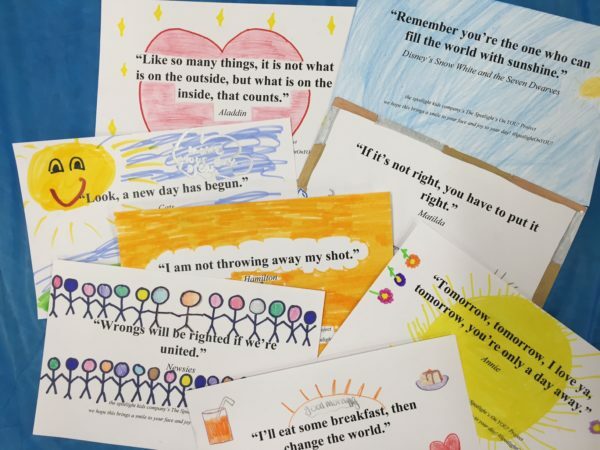 To begin, they brainstormed 140 of their favorite inspirational quotes from musicals and films. Then they printed them on individual cards, and got creative decorating them with colorful designs and images. This past weekend, high school crew members led small groups of cast members around to Madison businesses to ask if they could hang the quotes to spread joy to customers. (Of course, they all said yes!) So, be on the lookout for these quotes in store windows and displays throughout this holiday season! 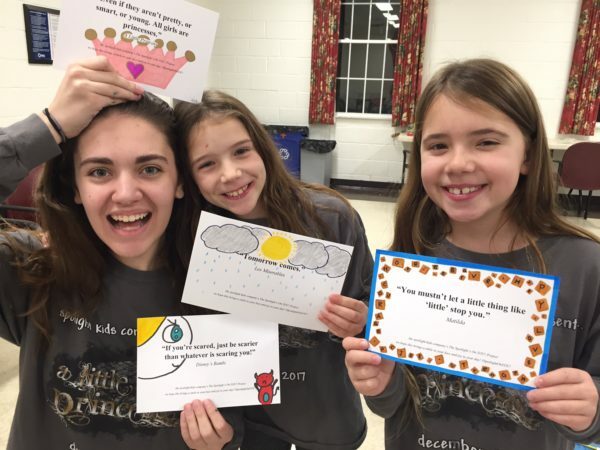 Kathryn and her crew developed this community service project as part of the Spotlight Kids Company's entry into the Playbill.com Newsies "Seize the Day" Challenge. (For information, click here.) Entrants are challenged with the question: How can we create positive change in our community? They then needed to activate a project to promote a positive change in their hometown or community. To enter the contest, groups submit a video about their project and its impact. Five finalists will be selected in February 2018, and the winner will be announced March 1. The grand prize winner of the Newsies “Seize the Day” Challenge will win the performance rights to the very first official amateur production of Newsies, an official PLAYBILLder for their production, and other special prizes. Full disclosure, my nine-year-old daughter, Becca, will be playing Donald in the Spotlight Kids Company production of A Little Princess, and she played Tootles in last December's production of Peter Pan, Jr. She LOVES being a part of SKC, and her theater and music skills, in addition to her confidence, interpersonal skills, and independence, have blossomed from being a part of this caring community. This entry into the Newsies "Seize the Day" Challenge is just one example of how SKC has brought joy to my daughter, her theater friends, and all of Madison. As one of my daughter's fellow theater-loving friends phrased it: "I found my people!" My daughter has found amazing role models of strong, creative, and loving middle school and high school cast members, in addition to Kathryn, SKC founder who is now a college sophomore in college, but has been producing plays since eighth grade. She beams when she sees fellow SKC members around town or at the community pool. So, really, this service project is just one tiny example of how Spotlight Kids Company brings joy to its members and the entire Madison community. Tickets are $12 for adults, $8 for kids under 18.